➡ LV Low Voltage Cable Lugs 600 / 100 Volts – complete range of copper cable crimp lugs for the termination and crimping of 0.5sqmm-1000sqmm stranded conductors in low voltage switchgear, control panels, transformers and junction boxes up to 3300v (3.3kV). 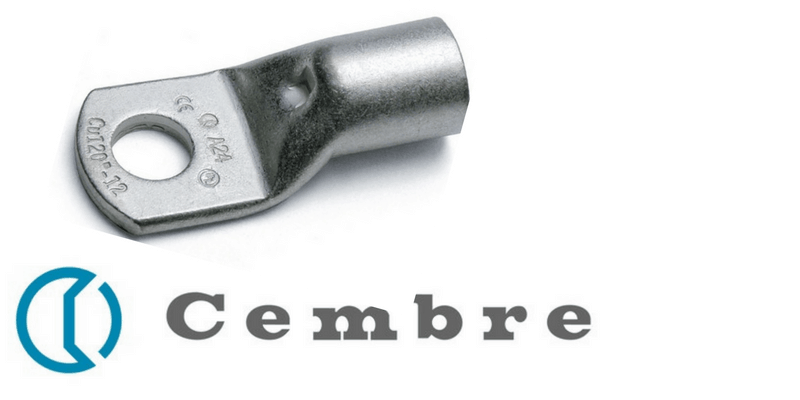 These cable lugs manufactured by Cembre are single bolt design typically used to terminate and connect circular stranded copper conductors to BS6360 Class 2 – several ranges of cable lugs are available for Class 5 flexible copper cables. Cembre A range of cable lugs are manufactured from high-conductivity seamless copper tube to EN 12735 with excellent electrical conductivity and copper purity greater than 99.5%. The cable lugs are electrolytically tin-plated to BS1872 and manufactured to meet the crimping requirements of BS4579 Part 3 when installed using correct Cembre crimp tool and die sets. Cembre A-M cable lugs are manufactured from high purity copper tube – A-M cable lugs are rated up to 11kV for dry indoor applications provided Cembre hexagonal die sets are used and the crimp lugs are installed using suitably calibrated Cembre crimping tools. Cembre A-M cable lugs, made from copper tube, are designed to obtain the most efficient electrical conductivity and mechanical strength to resist vibration and pull out. A-M copper cable lugs are annealed – applications subject to vibration require cable lugs to provide a reliable electrical crimped connection. Annealed cable lugs resist cracking or breaks between the cable lugs barrel and palm. Cembre A-M cable lugs feature an inspection hole to allow visual inspection of the cable conductor insertion into the cable lug barrel. The barrel length of the A-M cable lugs allow easy and accurate positioning of the hexagonal die sets during the crimping operation – cable lugs have an operating temperature of 150 Degrees Celsius. Note: Cable lugs suitable for medium voltage use up to 11kV when installed in dry indoor applications and crimped using calibrated Cembre tools with the correct hexagonal die set – typically used in conjunction with CMP cable glands for terminating low voltage armoured (SWA), unarmoured and braided cables with stranded copper conductors, 600 / 1000 volts. ➡ See complete range of LV Cable Lugs.